The Marilyn Monroe Hat Sitting inspired hat and many other Hollywood Starlets famous fashionable hats are in stock at Dallas Vintage Shop. When you need a dramatic, fun and fashionable hat consider this Marilyn Monroe Hat Sitting reproduction hat. Nobody in the DFW area has a larger or more creative hat collection than Dallas Vintage Shop. Here is our exclusive Marilyn Monroe hat recreation inspired by ‘The Hat Sitting.’ This oversized white floppy hat with a dramatic long stem red rose adornment is in stock as well as Marilyn Monroe fashions & costumes. 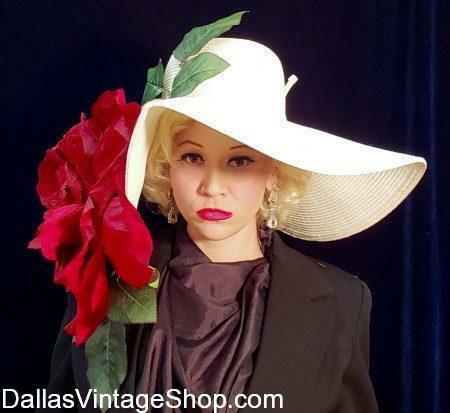 Not only does Dallas Vintage Shop have the Marilyn Monroe ‘Hat Sitting’ hat, shown here, we have plenty of Marilyn Monroe fashionable costumes. Also, you will find many, many other Hollywood Starlets hats, costumes, wigs and all the glamorous or gaudy jewelry, furs, extravagant boas and other accessories that will astound. Our Dallas hat shop department often recreates the hats and fashions of many Hollywood starlets, audacious historical people and classic Movie characters. This Marilyn Monroe hat is just one example of our complete inventory. There are many other Hollywood Starlets famous hat fashions in stock at Dallas Vintage Shop all year round. Prices for our hats range from Special Limited Editions to Supreme Celebrity Status Creations. But don’t be discouraged, we offer excellent, unique vintage and reproduction hats and costumes for median and economy prices too. Get this Marilyn Monroe Seven Year Itch Costume. We have this Marilyn White Dress and the Accurate Marilyn Wig to match the Famous Marilyn Classic Movie scene in Seven Year Itch. 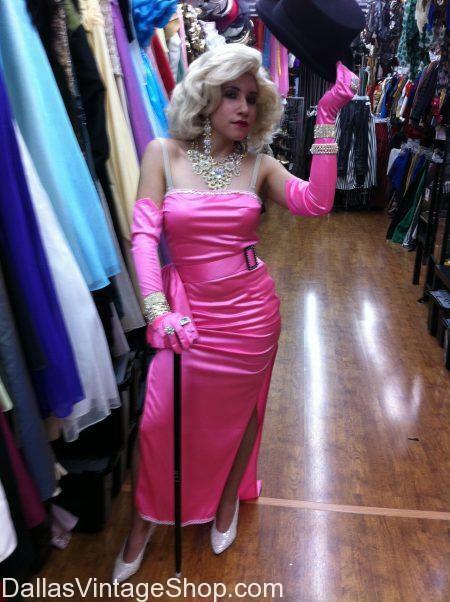 You will find other Iconic Marilyn Outfits and Wig Styles here at Dallas Vintage Shop. Get the Complete Deluxe Quality Marilyn Monroe Costume or just the Economy or Median Priced Costumes or Accessories. Shop early for Halloween but remember, we’re open all year. You are in Marilyn Monroe category.